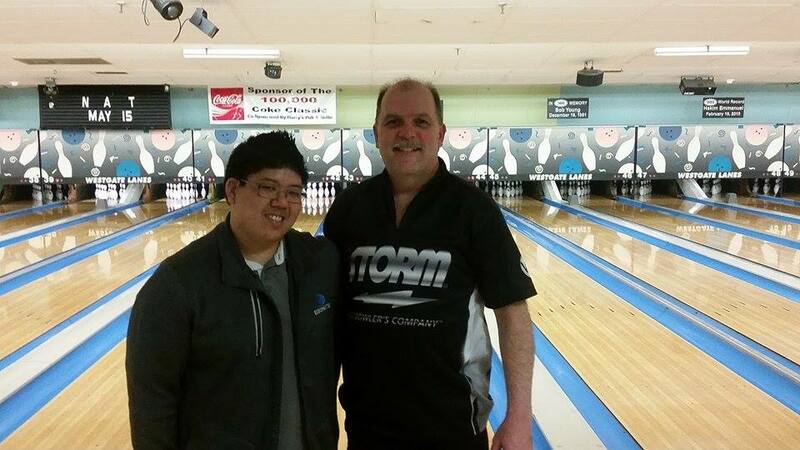 A big day at the Massachusetts state tournament at Greylock Bowl & Golf in N. Adams for Danny Khuu began with a 289 game in doubles, but really picked up steam when he and his partner, Brockton Bowling Association Hall of Famer Jim Ferguson, bowled what is thought to be the first 600 doubles game in state tournament history in the second game, after which Danny finished with a 222 for an 811 series. Combined with Jim’s 770, the pair took the doubles lead with a 1,581, which was one pin shy of the state tournament doubles record, set by Steve Blanchet & Jim Sicard two years ago at Brunswick Lowell Lanes. The day was not over for Khuu, however, as he proceeded to post games of 300, 279, and 236 for an 815 in singles, which may have taken over the lead in that event. He came up relatively short in team, with a 721, but that was still good for a 2,347 all-events score, breaking the state tournament record held by Jeff Fields, also set two years ago in Lowell.